We’ve all played around with our mothers’ saris as children, draping them haphazardly around our bodies and leaving a train of the material behind us as we tried to walk in them. But it’s a completely different ballgame when you debut in a sari as a young adult. I was all of 14 when I got the chance to wear my first — in the public eye — at a family function. And I still remember my aunt’s very terrifying threat to me that day, at my cousin’s wedding, where I spent the better part of the evening complaining about the discomfort I felt as I walked, stood or simply sat on a chair. “If I hear you say it’s unravelling one more time, I’ll rip it off in front of everyone at the function right that moment!” I managed to make it through the event without a wardrobe malfunction, thankfully, but only because I was stuck to one chair in fear. But, that was also the day I raked in compliments for my ensemble as never before. What is it about the sari that makes it so cherished a garment? It’s the one piece of clothing that has a charm, a timeless appeal that remains unmatched. As author and editor of Saris: Tradition and Beyond, Rta Kapur Chishti aptly writes in her book, ‘The bold and the shy, the silent but inquisitive, the athletic yet graceful, all manner of women hold their saris with characteristic ease, almost as if it were their second skin and not a textile extraneous to themselves.’ But then there are so many of us who have renounced our saris, sending them to far ends of our wardrobes — treating them to outings only during weddings and celebratory occasions. In an age of revival, of remembering our heritage, it’s time to #BringBackTheSari as daily wear. 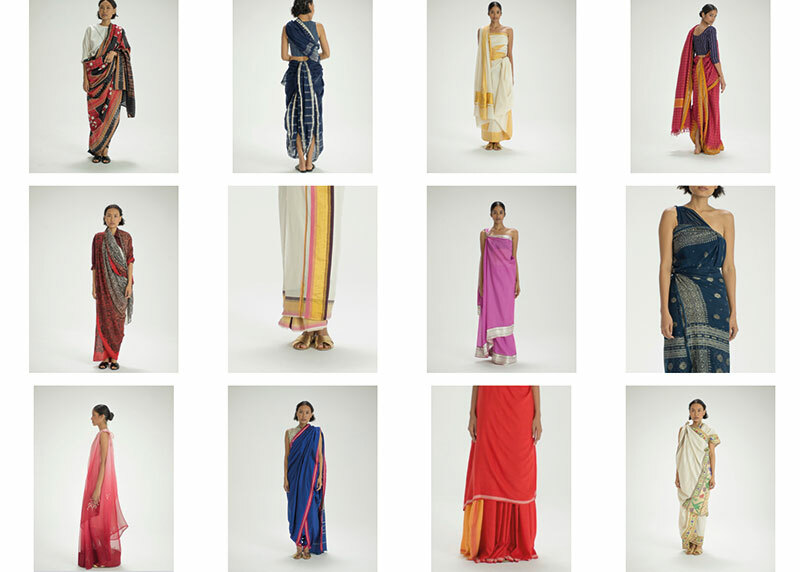 And the digital publication Border&Fall is majorly contributing to this initiative with its new online project, The Sari Series — An Anthology Of Drape, entrepreneur Malika V. Kashyap’s brainchild. Including a series of over 80 short ‘How to Drape’ videos — Verve is an associate producer of 15 — and three independent films by film-makers Q, Bon Duke and Pooja Kaul, The Sari Series aims to address the perception of the garment today, and start conversations on its contribution to our heritage and society. ‘This project is not only a documentation; it is an opportunity to further develop our aesthetic — allowing for a visual representation of the sari that does not come across as either ‘traditional’ or ‘contemporary’ (or worse — appropriated). Those of us working with India’s design communities are acutely aware of the burgeoning aesthetics that still lack a representative set of visuals and language to accurately express the changes taking shape,’ says Kashyap in her essay on the initiative. Most of us are familiar with the popular nivi style of draping the sari across the left shoulder, but this endeavour gives us the chance to learn of several drapes from over 15 states across the country. From the frequently seen Gujarati seedha palla and the Bengali styles (Bollywood movies and television soap operas, thank you very much) to the lesser known kaccha kattu drape of Andhra Pradesh and the Christian kunbi drape from Goa, the videos explore easy-to-learn ways of wearing the piece of clothing. ‘The sari drapes we have (but don’t wear) happen to be very relevant to today’s context — whether for the sake of style, sustainability or India’s rapidly changing culture. Perhaps part of the reason is because there is no easily accessible place where one can understand how to drape them with ease,’ explains Kashyap. As Chishti — who’s also the ‘sari adviser’ for the project — says in her book, ‘The sari has been our means of finding a pathway through the labyrinth of India’s inherited material/textile culture…. It takes us headlong into the intangible aesthetic, philosophy and technology from which it emerges’. As for me, I can now drape the lovely saris inherited from my grandmother in under five minutes, and could probably dress in them daily for the rest of my life. And thanks to Border&Fall, those wanting to be a part of the #SariRevival will now have over 80 styles to pick from.